Text Me, Love Mom | Welcome to Text Me, Love Mom where I blog about 'the next stage of parenting' – when the kids have left home and you're looking out for your family from afar. I also go yippee ki-yay over an array of topics. See the ABOUT page to learn more about the book – Text Me, Love Mom, especially if you have the kids leaving home jitters. It’s that time of year again – in the air there’s a feeling of Christmas. With that comes a house upside with; boxes of decorations, stacks of cook books, half finished ambitious holiday projects to pack up for another go another time. And the first coating of pine needles – because we insist on the real tree – is sprinkling down over the furniture. I closed the mall tonight hemming and hawing over tricky gifts that I didn’t buy, while purchases that felt unique, but maybe weren’t, filled my bags. At the grocery check-out, where I stopped for bread for our peanut butter-toast dinner, I bought a magazine promising a simple Yuletide menu and am now nodding off in bed browsing its decidedly not simple recipes – too many fancy sauces and spreads to make when the household will really be becoming undone with all four kids home and the kitchen busy 24/7. Gift shopping is almost a fait accompli though I’m a guilty over-consumer jotting notes in my phone, for just one more item for the tricky-to-buy for family member. I fall asleep by reciting and revising my next day to-do list; pick up holiday dry cleaning, book a haircut, return the too tight party shoes, make the homemade potpourri for the yoga women’s lunch, buy granddaughters pjs, take my mom out shopping for my dad and vice versa … and stop my head from spinning. And above all the bustle I still hear silver bells, and anticipate the holiday with a joyous spark of delight. Why? Because I’m siding with Bing Crosby and Christmas Eve will find me where the lovelight gleams. My big family, which has spread far and wide, will be together for a feast that will end with the once-a-year Christmas pudding – a symbol of these time – fussy and time consuming to put together, but so special and longed for, and worth every mouthful. 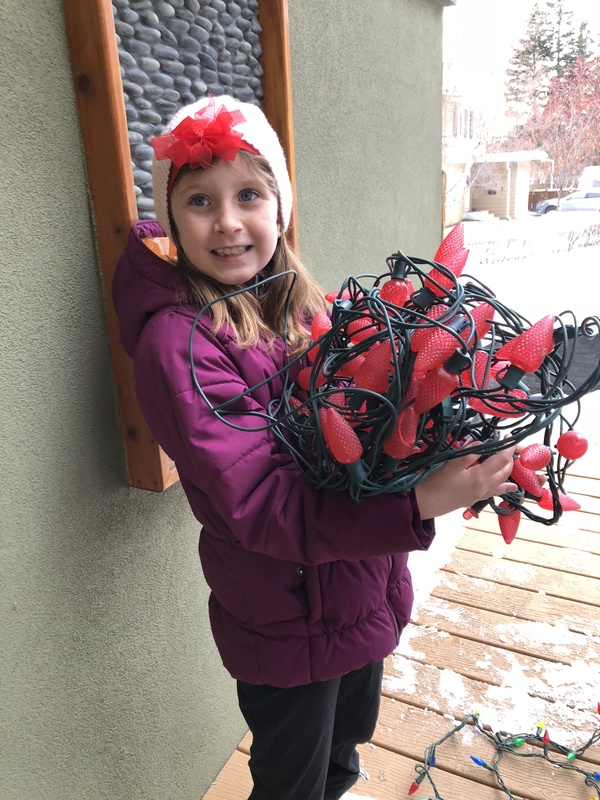 For eleven and a half months it’s been easy to keep our home tidy and organized, but for this stretch – from Santa’s visit to the singing of Auld Lang Syne – it will be noisy and chaotic with almost a dozen folks being loud, ravenous, merry and bright. Ah – joy to the world! 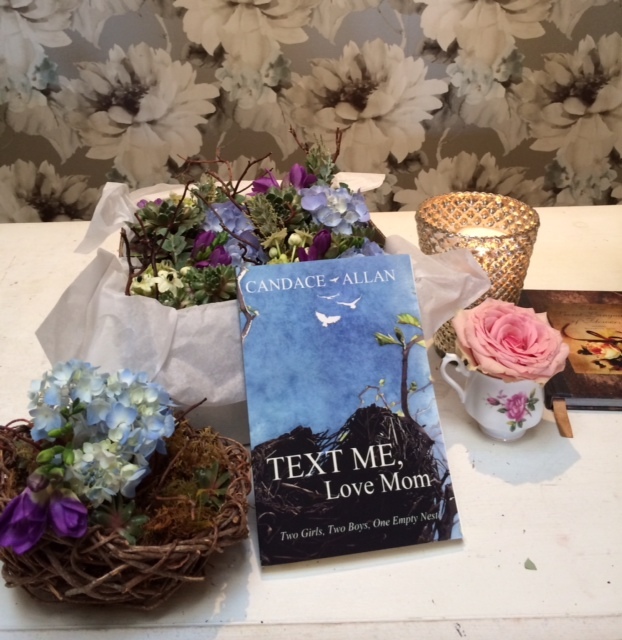 Would you get a kick out of reading more of the chaotic antics of Candace Allan’s family – read her book by clicking here Text Me, Love Mom; Two Girls, Two Boys, One Empty Nest. Buy it in time for holiday gift giving. I want to lean into this stretch of time I have here at the lake. Not to think of the days counting down – but instead of the days adding up. Today was as full as a day at any lake day could be. I had company, my niece and a girlfriend were sleeping when I wound my way down to the beach and slid the kayak into the lake before climbing in. It was the years first kayak ride with the lake still and even, just ripples in the hot sun. I paddled out to watch neighbors following kids out for an early swim or setting out on deck chairs with coffee. Afterwards I came home to see my niece and her freind off – hugging and taking last photos into the bright sun. Invigorated by the kayaking I decided to bike but it was already so hot that I turned back at the first hill, and spent my energy instead with a swim. After towelling off and deadheading the geraniums I read my book with the guilty pleasure of chips and dip, stopping to text with a friend and my sister. The deck rocked with the rolling water from all the ski boats enthusiasts yelping as they rode the waves. It was noisy and a bit wild, but I liked that seeing as there is such a short time for us Canadians to be raukus sun-worshippers before winter will drive us inside again. I called my brother and continued the family talk about helping our parents through a move from their home to a seniors residence- such tricky times to be an adult ‘kid’. I thought about how, if my own four children need to keep their dad and I ‘safe’ someday this will be the first place they try to discourage us from coming to – worried about ‘an elderly version of us’ on the dock, or climbing the rocky slope from the lake, or even making our tired way to our upstairs bedroom. I tried not to think too hard about that while I brought the day to a close watering plants and picking deep purple basil to eat with a plate of tomatoes and soft cheese. I couldn’t help my mind going there though on this summer’s day, with its mix of summertime action and tranquility. “Spring has returned. The earth is like a child that knows poems.” – Rainer Maria Rilke. March. March, March. The word sounds like spring. Like hope. Like the smell of thawing earth. The smell of renewal and something you can taste coming to an end. That was the way I began one of my most ‘liked’ blog posts. I’ve puzzled over the popularity of that post that was a simple tribute to spring, but I must have done so wrapped in the warmth of summer, or delighting in the first blanket of snow changing a dull brown yard to a magical white one, because if I’d thought about it at this stubborn time of year I might have grasped why it garnered so much attention. Its easier to understand its popularity today, and yesterday… and all the frozen days before – in this winter that refuses to give up its grasp. Spring with a promise, just a promise blowing in the wind, of buds pushing out of the ground, of light cleansing rains washing away the sifting dirt of winter, of a neighbor reporting the sighting of a good luck robin, of a hard crust of snow melting in an afternoon, the winding hose left out during a late October blizzard appearing again. Birds sing in the morning and sound lighter, water drips off the roof and a cat meows in heat. I swear people too are more animated, slightly off balance with the extra light and sense of coming out of the dark, having made it through the long nights. March – skip past us, deliver us to the newness of another season. I spot another skinny teenage boy in an ill-fitting rental suit standing with his date, who took a hundred and ten percent more time imagining, choosing, and adjusting her glamourous outfit for the evening. They are with a fancy dressed crew of their peers laughing and acting giddy after all the attention of the day. I feel happy even for the weather – for the warmth of the evening sun setting on these kids as I drive by them, but mostly I feel nostalgic for the fun we had at my own four kid’s high school graduations. It’s June. And June makes me think about writing the book, Text Me, Love Mom, and how the tale started with my eldest getting that letter in the mail telling all of us that yes, she would be leaving home to go away to college six-hundred miles from home. As nervous as I was (was she more or less so?) it was hard to fathom. I was still driving her to piano lessons once a week, reminding her to bring a jacket on cool nights, putting in my two cents about – well – most everything. And she was going to somehow go off and live in a faraway city, (never go to another piano lesson) and get up every day and be part of something else entirely separate from us? Yes, of course, she was. As excited as those kids are that I pass on June nights, getting out of limos, or milling in parks in their dress-up clothes, maybe even dishing out money in a restaurant before or after a graduation event – somewhere there are parents whose trepidation and worry matched that excitement. The clothes had been bought and the limos rented by moms and dads who didn’t see how that kid would manage without them – their managers. That gang of youths getting ready to party hard had parents who were losing their concentration at work when they thought about their household ticking along with their son or daughter absent from it. Of course, not all the recent grads will go away. Some of them will get jobs or go to local colleges, but still life changes. They’ll stake out used furniture and share apartments with friends, travel to countries their parents have never been too, or find their people in another city. I know now that they do come home to perch now and again, but there is no denying that this dress-up ritual, and the cap and gown, and late late night parties are part of the threshold to a new sort of family life. I had company, my niece and a girlfriend were sleeping when I wound my way down to the beach and slid the kayak into the lake before climbing in. It was the years first kayak ride with the lake still and even, just ripples in the hot sun. I paddled out to watch neighbors following kids out for an early swim or setting out on a deck with coffee. Invigorated by the kayaking I decided to bike, but it was already so hot that I turned back at the first hill, and spent my energy instead with a swim. After towelling off and deadheading the geraniums I read my book with the guilty pleasure of chips and dip, stopping to text with a friend and then my sister. The deck rocked with the rolling water from all the ski boat enthusiasts yelping as they rode the waves. It was noisy and a bit wild, but I liked that seeing as there is such a short time for us Canadians to be raukus sun-worshippers before winter will drive us inside again. I called my brother and continued the family talk about helping our parents through a move from their home to a senior’s residence- such tricky times to be an adult ‘kid’. I thought about how, if my own four children need to keep their dad and I ‘safe’ someday – this place of ours will be the first place they try to discourage us from coming to – worried about ‘an elderly version of us’ on the dock, or climbing the rocky slope from the lake, or even making our tired way to our upstairs bedroom. I tried not to think too hard about that while I brought the day to a close watering plants and picking deep purple basil to eat with a plate of tomatoes and soft cheese. I couldn’t help my mind going there though on this summer’s day, with its mix of summertime action and tranquility. (If you’d like to read more by Candace Allan – see Text Me, Love Mom – the book.